In 2015, there was significant variation by age group in the percentage of smokers considering quitting in the next 30 days,55 but not in the next 6 months56 (Figure 6.11). 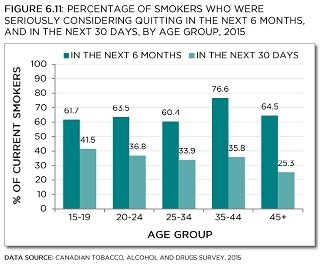 Of those seriously considering quitting in the next 6 months, roughly half were also considering quitting in the next 30 days: this decreased with age from two-thirds of youth to 40% in the oldest age group. 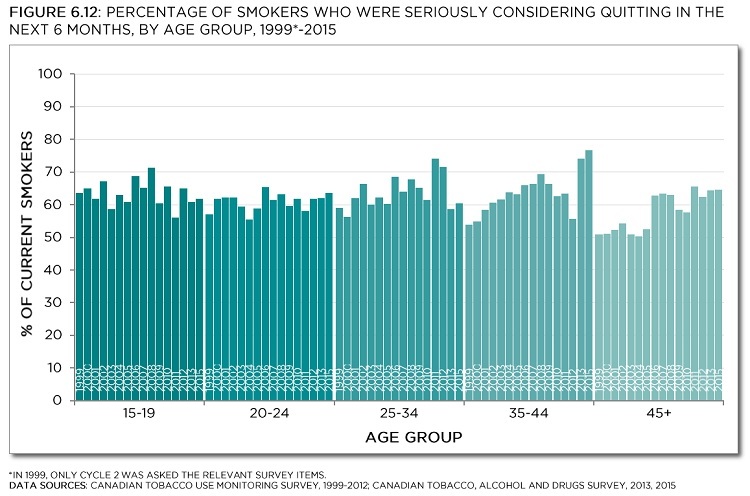 Over time, although no clear patterns emerged among younger smokers, the percentage of smokers over 35 seriously considering quitting in the next 6 months appeared to increase with time, particularly among the oldest age group (Figure 6.12). * In 1999, only Cycle 2 was asked the relevant survey items.